Blue whale information is fascinating! It is a fact that this whale is the largest animal to ever exist on earth. Their average length is 75-100 feet and their average weight is 100-150 tons. They are about as long as two school buses, they have a tongue that is about as heavy as an elephant, and they have a heart that can weigh as much as a car. Underwater, the color of blue whales are true blue but when surfaced, their color is more of a mottled blue-gray. Their bellies have a yellowish color because millions of microorganisms called diatoms (single-celled algae) adhere to their skin to take up residence. Blue whales have a broad, flat head, very small dorsal fins, and long, thin pectoral flippers. Blue whales can be found living in all of the world’s oceans. They normally spend their time in the polar regions during the summer months and will migrate to warmer zones as winter approaches. Normally they will travel alone or in groups of two to four. However, larger groups (up to 60) have been seen. One really interesting fact about blue whales is the diet they consume. Despite their extremely large size, their primary source of food is krill, tiny shrimp-like organisms that are under 3 inches in length. During the summer months when they stuff themselves with food, they can eat up to 4 tons of krill a day. Instead of teeth, blue whales have hundreds of baleen plates attached to their upper jaws. These plates allow them to strain the krill from the water they gulped in before swallowing the tiny creatures. Females give birth every 2-3 years with the gestation lasting about one year. At birth, the calf is about 25 feet long and will weigh about 3 tons. When you think about this information, this newborn baby is already ranking among the largest animals on earth. Calves will consume only its mother’s milk, up to 100 gallons a day, until they are weaned at 7-8 months of age. Her milk is rich in fat which allows her calf to gain about 200 pounds a day (about 8 pounds an hour). Blue whales will reach sexual maturity when they are about 6-10 years of age. Before the 20th century, humans were not a threat to blue whales because of their massive size. However, in the 1920s (after factory ships and the exploding harpoon gun was introduced), humans began a killing spree that almost caused them to become extinct. Before they were protected in 1966 by the International Whaling Commission, some 360,000 blue whales were killed. Today, they are classified as endangered. It is estimated that only 15,000 remain. • The blue whale is among the loudest animals on earth. In good conditions, their sounds can be heard up to 1,000 miles. • They swim about 10 mph and up to 30 mph when alarmed. • When blue whales exhale, their spray (from the blowhole) can reach up to 30 feet in the air. • Their average lifespan is 80-90 years. The oldest known is believed to have lived 110 years. 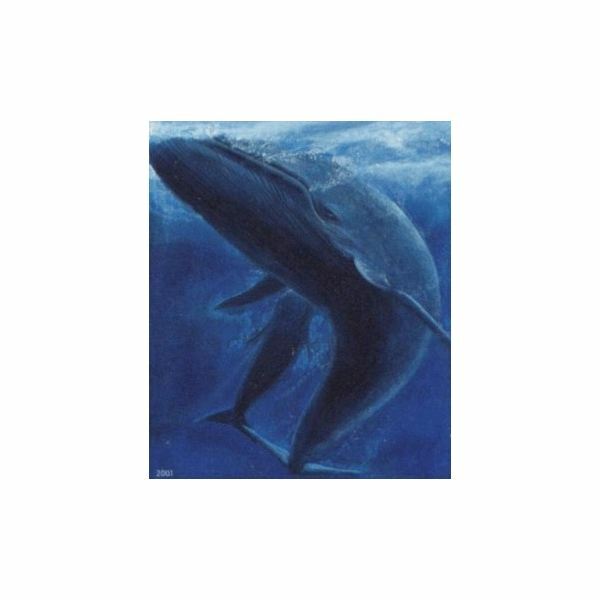 Blue whale image (stamp) in the public domain.